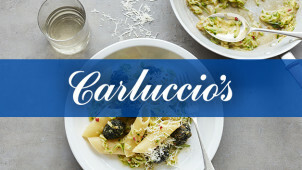 20% Off Food Student Discount at Carluccio's Valid Sunday to Thursday, eat in only! Carluccio’s was founded by famous restaurateur and professional chef Antonio Carluccio in 1999. Starting out as an Italian café and food wholesaler in London, today, Carluccio’s operates from almost one hundred locations across the UK. When he first opened the first Carluccio’s café, Antonio's aim was to provide great quality and authentic Italian food, but at sensible prices that everybody can afford. With Carluccio’s, you can enjoy a taste of the Mediterranean in an informal yet chic dining setting. They aim to provide a memorable dining experience in a happy and vibrant environment, using the basics of traditional Italian food to keep their customers coming back for more! The main menu consists of filling and tasty meat dishes like steaks and roast chicken, fish dishes as well as pasta dishes. With the pasta dishes you have the rare treat of splitting three pasta meals between two to share – or you could order three for yourself of course. Finish your experience with an excellent selection of desserts that include fresh fruit and warm chocolate bread and butter pudding – mouth-wateringly good! How do I use my Carluccio’s voucher? Choose the discount voucher that you’d like to use, and click on ‘Your Deal’ to either receive a code or a printable voucher if one is required to claim the deal. You will be informed at this point if you will need to print the voucher. Go to the Carluccio’s website and choose the restaurant that you’d like to eat at. Then, you can book a table. Once you arrive at the Carluccio’s restaurant, you should let your waiter know that you will be using a vouchercloud discount voucher before you order. This will make it easier for them to apply the discount. When paying, present the waiter or cashier with your voucher and enjoy your savings! If you’re looking for tasty food at affordable prices, then don’t forget to check out the Chef’s Specials, where you can truly get a wonderful taste of some of Italy’s best dishes on offer. From venison tortelloni that can be enjoyed as either a starter or main to rich braised beef cheek and stunning wines hand picked by the restaurants themselves. When do Carluccio’s restaurants open? Carluccio’s opening times vary from restaurant to restaurant depending on the location and other factors. In order to find out the opening times for your nearest Carluccio’s restaurant or any other across the UK, you can use the handy restaurant finder tool on their website. Although you can book a table on the Carluccio’s website, it’s not required and visitors can also turn up on the door. However, it’s advised that you book a table if it’s expected to be busy, for example over the festive period or on special occasions such as Mother’s and Father’s Day. Do Carluccio’s restaurants cater for special dietary requirements? Carluccio’s restaurants offer vegetarian options, however, they will do their best to cater to any other special dietary requirements on request. If you have a specific query about the food that you are going to order, you should call your local restaurant to inform them. A proud authentic Italian restaurant chain, Carluccio’s offers ingredients fresh from Italy and restaurants with chic, atmospheric décor that makes you feel like you’ve just been transported abroad. With your Carluccio’s vouchers, you can make some great savings on authentic, traditional Italian dishes, wine, desserts and coffee. With restaurant staff who go the extra mile to make sure that you have the perfect dining out experience, Carluccio’s is one of the best to choose from if you’re hoping for an authentic Italian experience along with the food. Along with their restaurants, Carluccio’s also cater for picnics. Picnic food can be ordered online from Carluccio’s up to twenty-four hours in advance of your event, and will contain a range of tasty foods and nibbles for your guests to enjoy. The classic picnic option includes everything that you’ll need for a traditional Italian-style picnic, with antipasti, biscotti, olive focaccia and various tasty tarts along with a tasty filling main dish of chicken. Carluccio’s was founded by top chef and restaurateur Antonio Carluccio, and many of the current dishes on their menu are still based on his signature recipes that he started back in 1999. Experience classic flavours of Italy without splashing the cash when you use our Carluccio's offers. The 2 for 1 on mains is an offer worth signing up to our newsletter for, so you won't miss out on the chance to enjoy some the best classic dishes the next time this promotion is available.